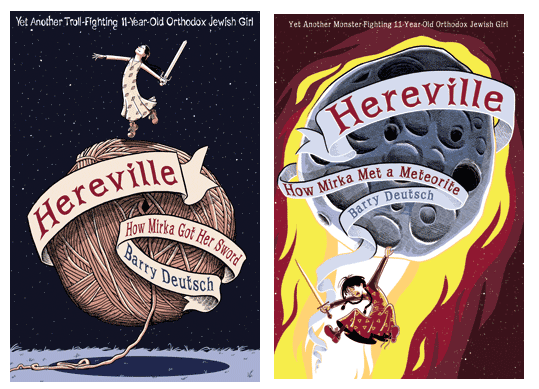 I have been anxiously awaiting Hereville 2, which has an “official” publication date of November 1, 2012. I saw the cover on a book at Book Expo, got very excited, and then grabbed it to open it and find the cover encased the first Hereville book. Needless to say, that was not the only dummy in the room. When I complained to Jason Wells, he told me it would be available on Net Galley. When I returned home from Book Expo, I immediately registered for Net Galley. It’s free, and I’ve been enjoying my subscription immensely for a number of reasons. I feel like I have a wonderful secret because I am seeing books pre-publication. I have the kid in the candy shop experience of perusing titles, but from the comfort of my home (often in pajamas). My family appreciates that there are no physical books coming into the house to crowd them out. Finally, since we moved to Israel, it is prohibitively expensive and slow to have books shipped. So yay for Net Galley. Now, back to Mirka. The net galley is definitely not the final product. There are some pictures missing, some pictures sketched, and some that need some coloring. But, honestly, it’s Mirka! My favorite plucky, knitting, Sabbath-observing heroine is back with another adventure. Okay, a little plot spoiler. Mirka is faced with an exact physical copy of herself, but the copy is stronger, neater and better in many ways. But when it comes down to it, the copy can never truly be Mirka because it is Mirka’s way of doing things, of not being neat or strong or good at math that makes her who she is. It is reminiscent of the story of Reb Zusha, who does not worry whether, at the time of judgment, he will be questioned as to why he was not like Moses, but that he was not like Zusha. I also liked that Fruma, Mirka’s stepmother, was a little more nuanced and provided more of the mussar. One aspect of this was showing Mirka that using your brain to figure out strategy, like in chess, is a way of winning in battle. She also emphasized acting like the person you want to be – excellent practice for developing character. Loved the knitting (spoiler – new projects!) and the Regret-O-Meter. And I loved the Moon. Consistent with Jewish thought, the Moon is female, and she does her thing in a modest and helpful way, also teaching Mirka that not everyone has to know when you do something good or wonderful – just the act of doing it brings you closer to being the person you hope to be. So to Barry, a grosse yasher koach (a big congratulations). Now I am even more excited to see the final product, and I am looking forward to Hereville 3. Thank you for the post. found you on the Jewish Book Carnival. I have been not exposed to graphic novels. But, want to give it a try. Perhaps this is the one I will try for. Thanks again.